Think flamboyant street parades accompanied by wild music and lots of laughter. Rio de Janeiro captures the spirit of Brazil, with exotic scents of ripe Passionfruit, Lime, Raspberry and Orange, to give your senses an instant lift. 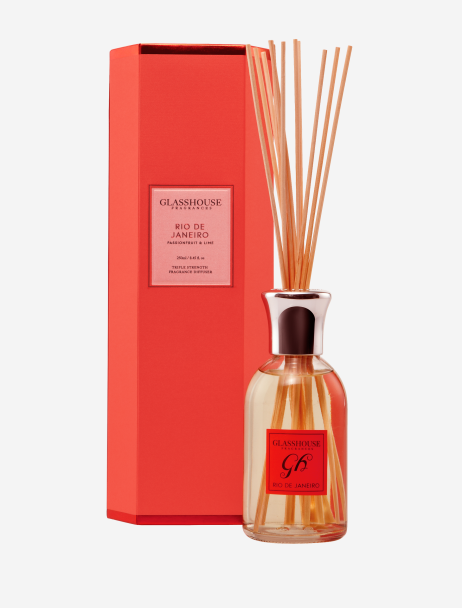 Glasshouse 250ml Triple Strength Fragrance Reed Diffusers deliver a low-maintenance and generous scent in the air which lasts up to three months. Flip as often or as little as you like depending on how much fragrance you’re after.